It has now been one full week since I installed the two new packages of bees in their new homes in my apiary. 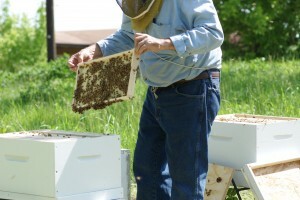 Until today, I have been cautious about removing frames from the hives and disturbing the new colonies. This is because of the presence of young queens and the disruption to the bees that occurred during their transportation and introduction into the hive. 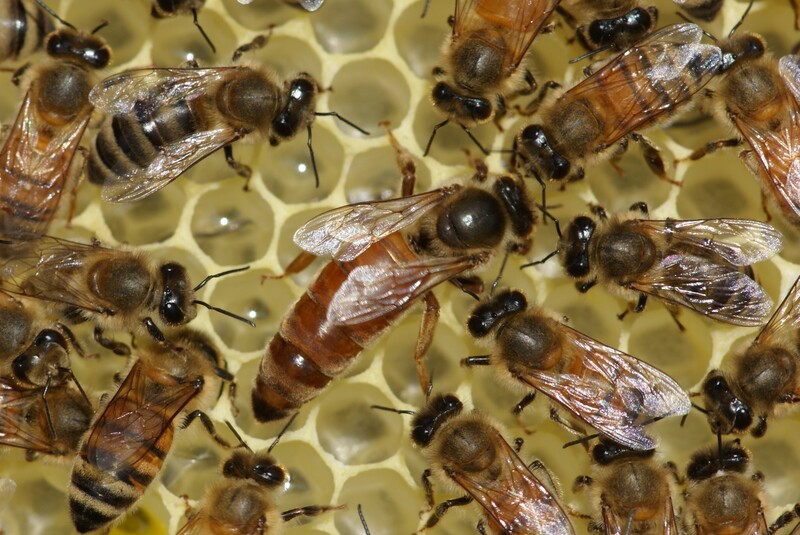 In circumstances like these, bees will sometimes enclose the queen in a “ball” of bees, killing her in the process. 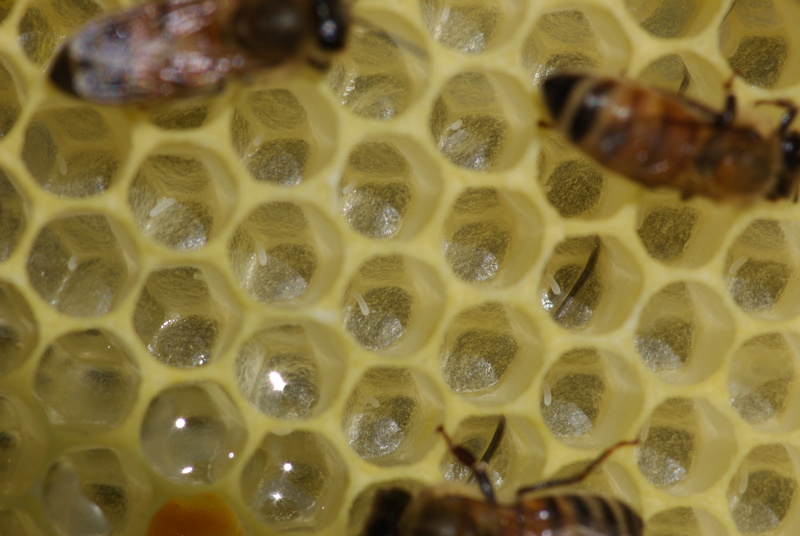 This behavior of “balling the queen” is not well understood, but sometimes occurs in times of stress in honey bee colonies. This is why I leave the bees alone, with the exception of removing the queen cage and replenishing sugar syrup supplies, in the first week after installing the new package. I apply the same one week moratorium when re-queening hives or setting up nucs. I start my examination with hive #1. Hive #1 is the hive where I found the queen dead in her cage before I installed the package (see previous posts in this series), and subsequently found another queen in that hive, which had been loose in the package with the bees all along. 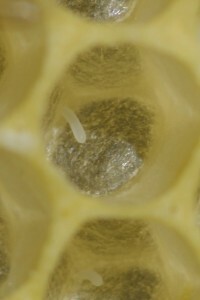 I saw eggs in this hive when I inspected it a few days after installation. (Since the queen in the queen cage was dead, I was free to look through it without waiting an entire week.) Today I found much drawn comb, and nectar (or likely sugar syrup) and pollen in the comb, along with eggs and young larvae (uncapped brood). I also saw the queen – see photos. In hive #2, I saw drawn comb, nectar (or sugar syrup), and eggs. I did not see the queen, but the presence of eggs told me that she was there. Finding the queen is rarely a goal of my hive inspections; the existence of eggs or young larvae are enough to confirm her presence. The only time I look for the queen is when I wish to replace her (the old queen must be removed if a new one is installed), or when I’m removing frames of brood to make a nuc or doing other manipulations where I’m concerned that I could accidentally remove her. I do believe in marking queens to make them easier to see (especially helpful to novice beekeepers), to let me know when a queen has been replaced by the colony (due to swarming or supersedure), and to tell me (with the aid of my hive log) her pedigree and how old she is. 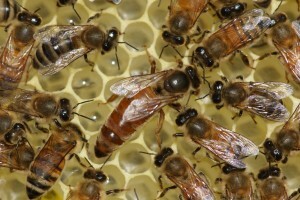 The queens in these hives are unmarked. Within the next couple of weeks, I will mark them and demonstrate how I do that in a post. Hive #2 looks good, but as I observed (and noted in my post) when I removed the queen cage, I have had a movement of bees from hive #2 to hive #1. In hive #1 I have about 7 frames covered with bees with at least some drawn comb on each – in hive #2, about three frames with drawn comb and bees. This movement or “drift” is not unusual when new packages of bees are installed next to each other. It may be increased if the hives are very close, 3 feet or less, but in my case the hives are about four feet apart. Their proximity may still be a factor, but possibly more significant is the age of the queen in hive #1 (the one that was loose in the package.) She could easily be older by several weeks, and producing more queen pheromone than her counterpart in hive #2, which might attract bees to her hive. 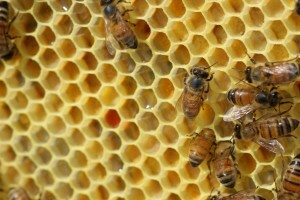 Another possible explanation could lie in the process used to place bees in packages. Some package bee producers shake a large number of bees from various hives into a large “shaker box” and from there transfer the bees to packages. It is possible that bees that are closely related (sisters or half sisters) ended up in separate packages and have now reunited in my bee yard. However, all of these possibilities are conjecture on my part, and the cause is not really important. What matters is that about 3/4 of the total bees from these two packages are now in hive #1, leaving #2 relatively weak. What do I do about it? I made an attempt to equalize the bees and drawn comb in the two hives. I first located the queen in hive #1, so that I knew which frame she was on and would not accidentally move her in the following manipulation. I then moved two frames of drawn comb along with the bees on the frames from hive #1 to hive #2. This gives me additional bees in hive #2 and fewer in hive #1. I will continue to monitor the numbers of bees in these hives in the following weeks, and will do additional transfers if needed. We’ll see. You may wonder if moving frames of bees from one hive to another will cause problems, i.e. fighting. 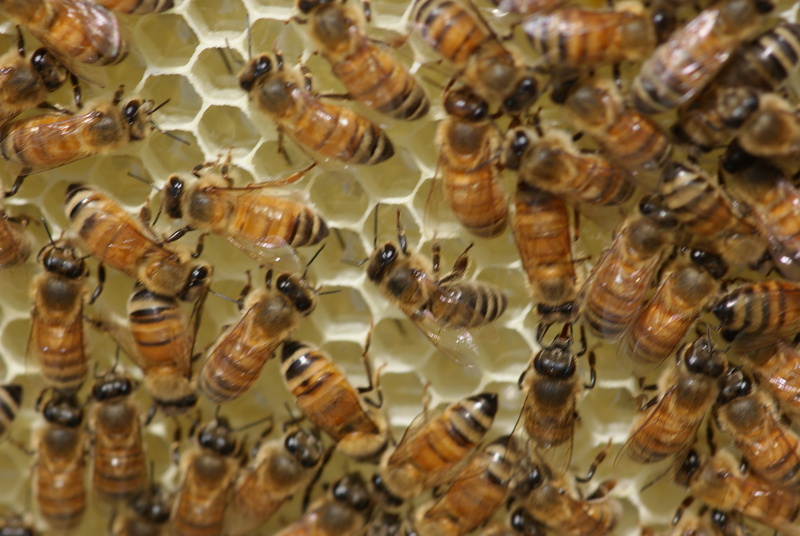 Though bees will fight if large numbers from one hive attempt to gain access to another through the entrance, beekeepers can move whole frames of bees without disruption. I think that time of day, weather, and nectar flows make a difference when doing manipulations of this kind. When it’s a nice day, bees are so busy collecting nectar and pollen, drawing comb, etc., that they don’t pay attention to the sudden appearance of a frame or two of foreign bees in their hive, especially when those bees are also busy at similar tasks. Within a short period of time, the bees and comb that were moved take on the odor of the new hive and become part of the colony. I perform these manipulations frequently, and do not ever recall a “bee war” breaking out. I have also noticed that both of these colonies are consuming the sugar syrup slowly. In a week, each has consumed most (perhaps 3/4) of the two quarts of medicated sugar syrup I provided when I installed them. This is a low rate of consumption based on my experience, but I am not concerned. The reason for it, I believe, is the very ample natural nectar available in the area. I’m also observing (as reported), good comb building, egg laying and depositing of nectar or sugar syrup in the new comb in both hives, so I’m certain both colonies are getting adequate food. As a result, I have not added any syrup to the feeders, and will not do so until they have consumed all of what they have now. In hive #2 (which has a top feeder) there is still some syrup, and hive #1 has about 1/3 of a quart in a jar. I’ll take a peek in the hives later in the week and I expect that they will be ready for a second hive body about a week from now. Watch for the next posts. If you would like to comment on the progress of your new hives or if you have a question, you can contact me using the comment box below. You can also email me at phil@philcrafthivecraft.com. You may have noticed an improvement in the quality of the photos in this post. That is because they were taken by my friend Mary Carney who is donating her time and camera skills for photos in this and future posts. Thanks so much for this posting! We just installed our first two hives on Friday and your info is answering a lot of the questions I’ve had about how much to feed, what to check for and how often to check. The pictures are very helpful as well. Looking forward to more. Half of my new package of bees have moved into hive 1. My question is we are moving in the next week and will have to move the bees. Would it be better to wait until after the move to swap a frame of bees from hive 1 to hive 2. If you do it at least a couple of days before moving them you’re fine. I just would not move the frame and then immediately pick them up and move them. Moving from one hive to another is not unusual. You may find they move again, if they do just wait until after the queens are out and laying and move a frame with eggs or larvae from the strong hive to the other, they will stay with the eggs or larvae. You have plenty of time to ajust them.